This EF 40mm f/2.8 STM Pancake Lens from Canon is a welcome addition to Canon's line-up of EF lenses--a light, inconspicuous "normal" lens. At a featherweight 4.6 oz, this is the lightest lens (along with the 50mm f/1.8 II lens) in the EF family. It's less than one inch long, so it will never draw unwelcome attention to you when you're shooting in public. A bright f/2.8 maximum aperture allows you to shoot under pretty much any lighting conditions, and the sophisticated lens configuration, including one aspherical element, guarantees high image quality from the center to the edge of the frame. The optimized coatings used in constructing the lens greatly reduce ghosting and flare, and deliver superb color balance. STM functionality provides quiet, smooth and continuous autofocus during video operation. The circular aperture formed by 7 diaphragm blades combined with the wide aperture can give you beautiful bokeh--the out-of-focus background areas of your images. 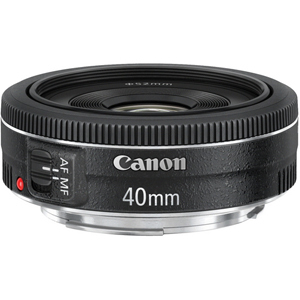 This 40mm lens will give you a view equivalent to 64mm when used on a camera with an APS-C sensor, and is able to focus as close as 11.81". If you're looking for a "normal", everyday lens, this is a good place to start. Newly developed STM technology for smooth and quiet continuous AF while shooting video. Short minimum focusing distance of only 11.81"